When a user logs in to a Red Hat Enterprise Linux system, the username and password combination must be verified, or authenticated, as a valid and active user. Sometimes the information to verify the user is located on the local system, and other times the system defers the authentication to a user database on a remote system. The Authentication Configuration Tool provides a graphical interface for configuring user information retrieval from NIS, LDAP, and Hesiod servers. This tool also allows you to configure LDAP, Kerberos, and SMB as authentication protocols. If you configured a medium or high security level during installation (or with the Security Level Configuration Tool), then the firewall will prevent NIS (Network Information Service) authentication. This chapter does not explain each of the different authentication types in detail. Instead, it explains how to use the Authentication Configuration Tool to configure them. To start the graphical version of the Authentication Configuration Tool from the desktop, select the System (on the panel) => Administration => Authentication or type the command system-config-authentication at a shell prompt (for example, in an XTerm or a GNOME terminal). After exiting the authentication program, the changes made take effect immediately. The User Information tab allows you to configure how users should be authenticated, and has several options. To enable an option, click the empty checkbox beside it. To disable an option, click the checkbox beside it to clear the checkbox. Click OK to exit the program and apply the changes. 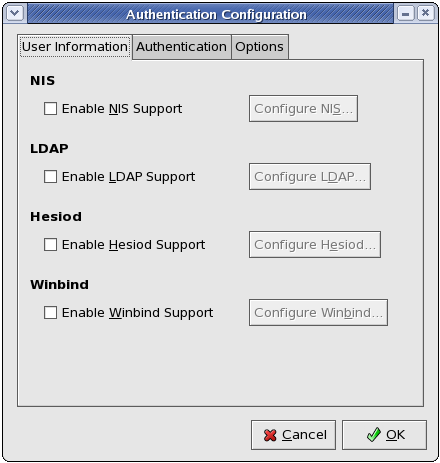 The Enable NIS Support option configures the system to connect to an NIS server (as an NIS client) for user and password authentication. Click the Configure NIS... button to specify the NIS domain and NIS server. If the NIS server is not specified, the daemon attempts to find it via broadcast. The ypbind package must be installed for this option to work. If NIS support is enabled, the portmap and ypbind services are started and are also enabled to start at boot time. For more information about NIS, refer to Section 42.2.3, “Securing NIS”. LDAP Search Base DN — Specifies that user information should be retrieved using the listed Distinguished Name (DN). LDAP Server — Specifies the IP address of the LDAP server. Use TLS to encrypt connections — When enabled, Transport Layer Security will be used to encrypt passwords sent to the LDAP server. The Download CA Certificate option allows you to specify a URL from which to download a valid CA (Certificate Authority) Certificate. A valid CA Certificate must be in PEM (Privacy Enhanced Mail) format. For more information about CA Certificates, refer to Section 21.8.2, “An Overview of Certificates and Security”. For more information about LDAP, refer to Chapter 24, Lightweight Directory Access Protocol (LDAP). Hesiod LHS — Specifies the domain prefix used for Hesiod queries. Hesiod RHS — Specifies the default Hesiod domain. The hesiod package must be installed for this option to work. For more information about Hesiod, refer to its man page using the command man hesiod. You can also refer to the hesiod.conf man page (man hesiod.conf) for more information on LHS and RHS. Winbind Domain — Specifies the Windows Active Directory or domain controller to connect to. user — This is the default mode. With this level of security, a client must first log in with a valid username and password. Encrypted passwords can also be used in this security mode. server — In this mode, Samba will attempt to validate the username/password by authenticating it through another SMB server (for example, a Windows NT Server). If the attempt fails, the user mode will take effect instead. domain — In this mode, Samba will attempt to validate the username/password by authenticating it through a Windows NT Primary or Backup Domain Controller, similar to how a Windows NT Server would. ads — This mode instructs Samba to act as a domain member in an Active Directory Server (ADS) realm. To operate in this mode, the krb5-server package must be installed, and Kerberos must be configured properly. Winbind ADS Realm — When the ads Security Model is selected, this allows you to specify the ADS Realm the Samba server should act as a domain member of. Winbind Domain Controllers — Use this option to specify which domain controller winbind should use. For more information about domain controllers, please refer to Section 19.6.3, “Domain Controller”. Template Shell — When filling out the user information for a Windows NT user, the winbindd daemon uses the value chosen here to to specify the login shell for that user. For more information about the winbind service, refer to winbindd under Section 19.2, “Samba Daemons and Related Services”.